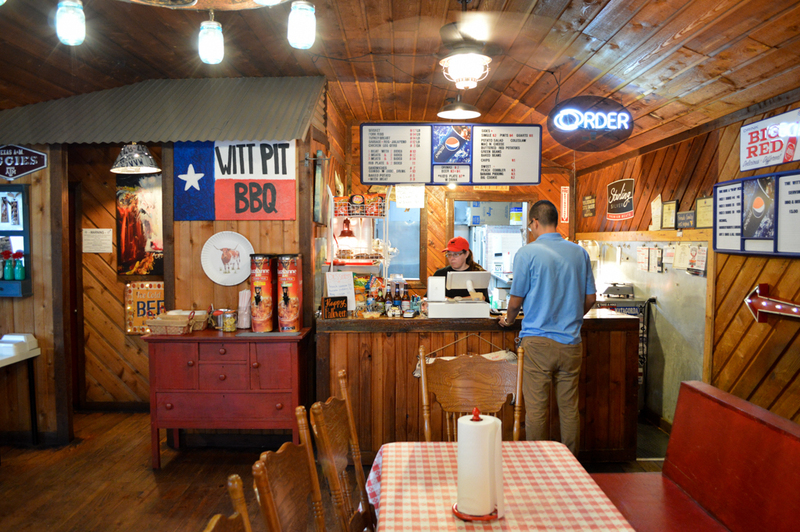 Witt Pit BBQ is in Rosenberg, Texas, which is just Southwest of Sugar Land. 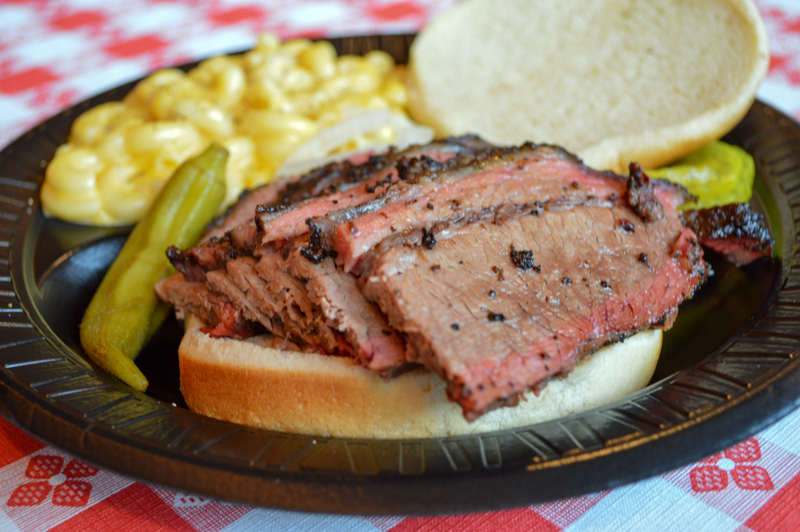 The Texas-style Real Pit BBQ Brisket here is one of the best I have ever tasted. If you live in the community, you already know. If you are in from out of town, I just let you know. 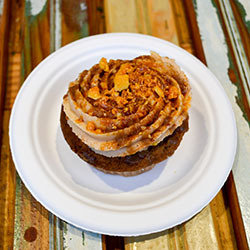 If you live within a 2-hour radius, it’s worth the drive. You can thank me later. 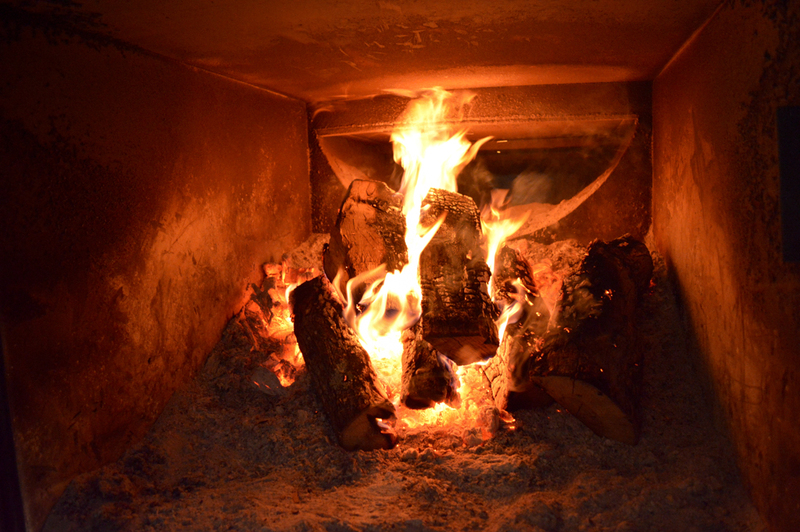 The BBQ game is nothing new to owners Randy and Shaunna Witt. 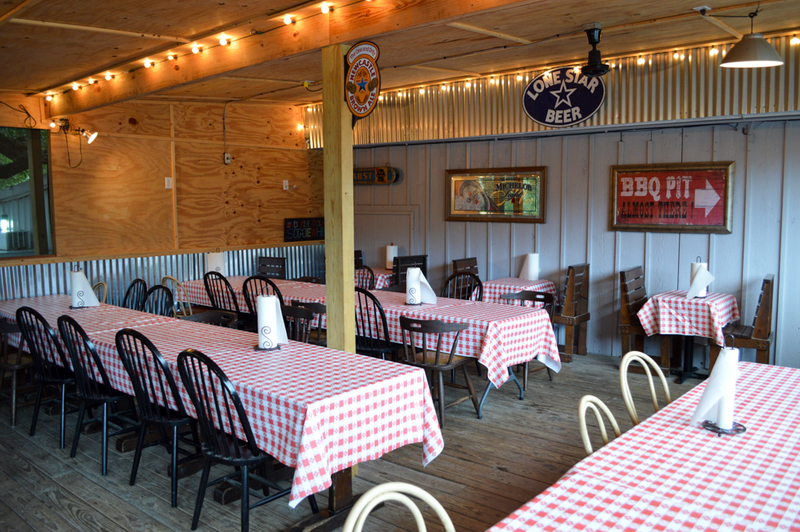 After 16 years of catering events in Fort Bend County, they decided to open a real cool BBQ Joint where they can serve BBQ lovers daily. I’m sure glad they did! 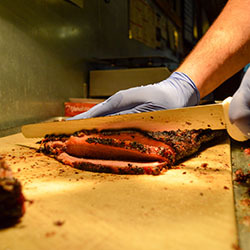 Witt Pit BBQ keeps it simple. 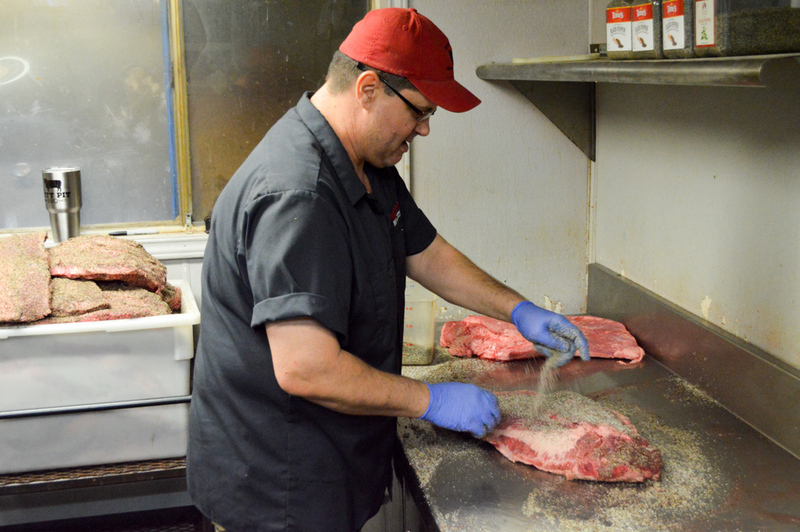 They smoke their meat on a 30-year-old steel offset, reverse-flow pit. 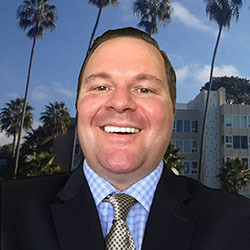 Randy let us know they don’t use automated smokers and never will. I like that attitude! 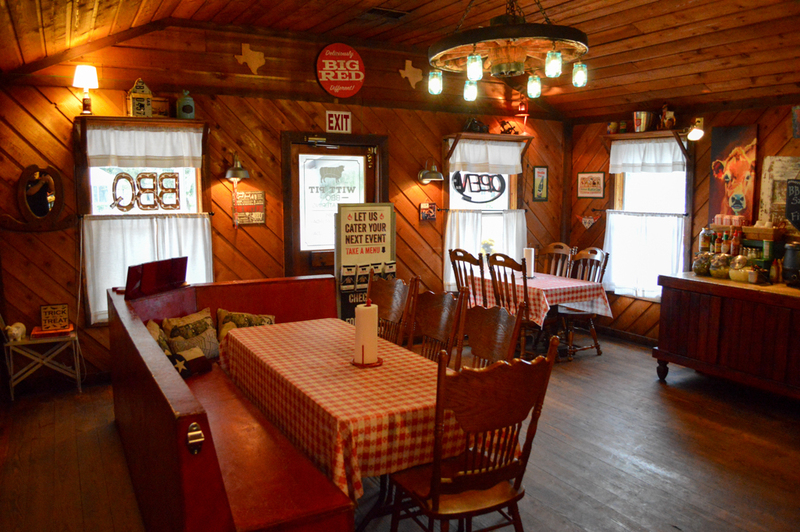 The restaurant is real cool and homey… let’s just say I know I am in the Lone Star State. 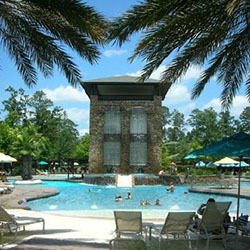 There are two rooms to choose from, the inside dining area and the large porch, which is perfect for large groups. That’s where we sat. 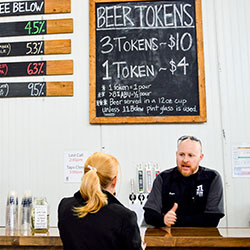 We went on a Friday and at Witt Pit BBQ, they celebrate “Craft Beer Friday”. 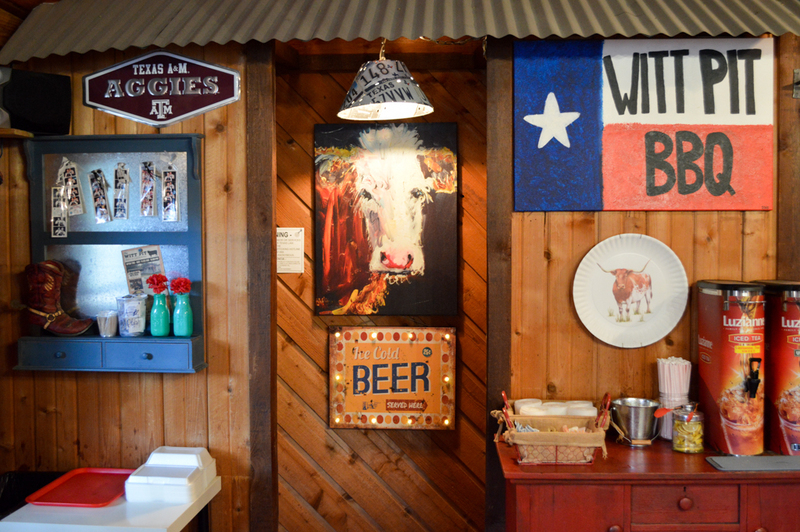 So, it’s the perfect place to stop in and get yourself a Top Texas Craft Beer and a Sliced Brisket Sandwich. And that was exactly how I started it all off… Saint Arnold Lawnmower to be exact. LOVE Texas! 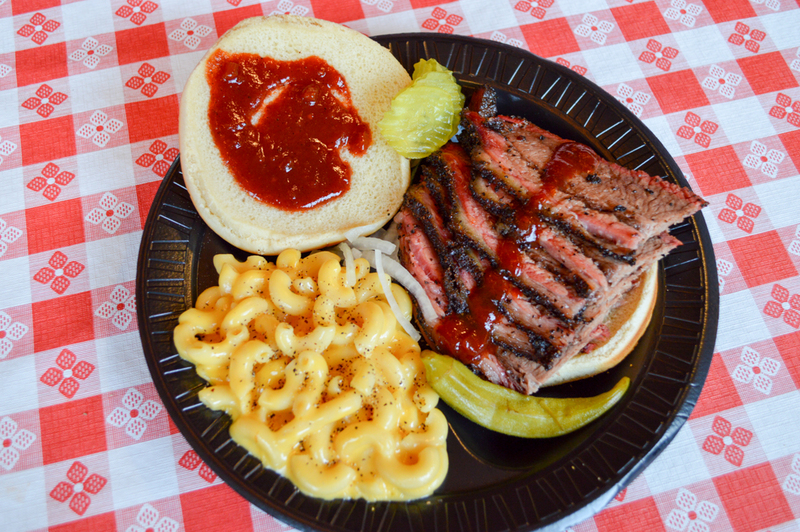 My Sliced Brisket Sandwich showed up with some real Mac and Cheese. 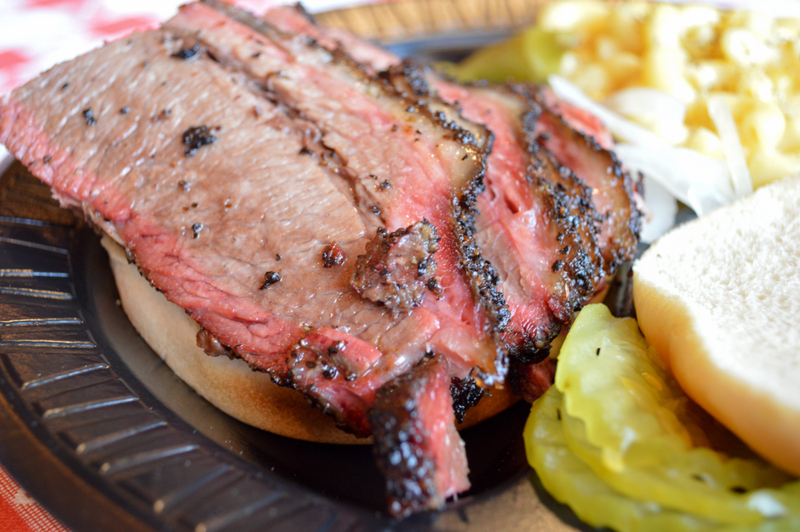 There must have been a half pound of Smoked Brisket on this incredible sandwich. The smoked flavor was perfect, not overwhelming. I asked for mine a little fatty, but if you prefer less fat, just ask. I should do this every Friday! 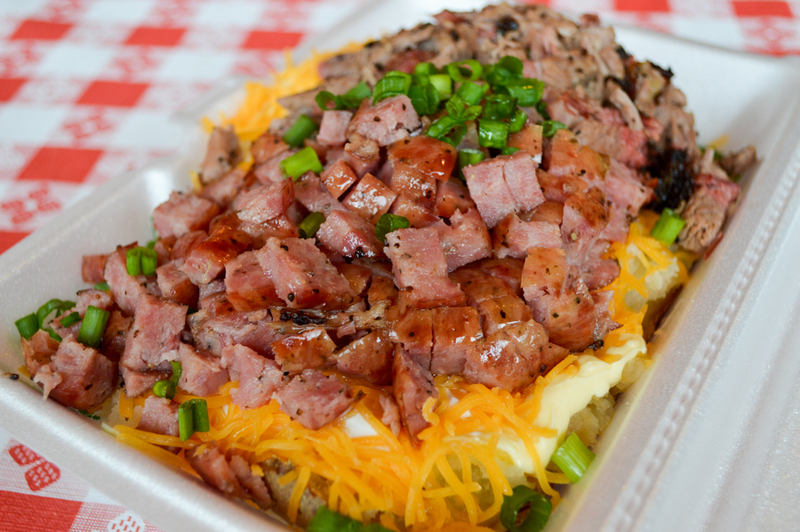 Several people had let me know about the enormous spud they have here at Witt Pit BBQ. Well, it’s no joke! 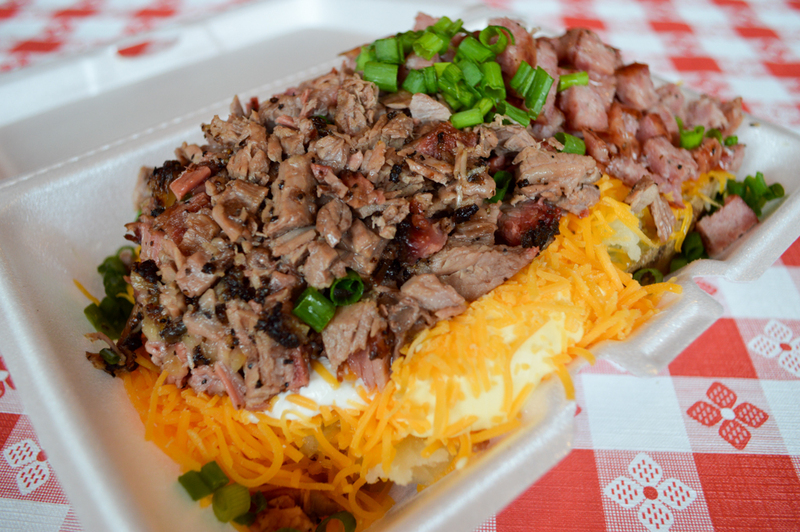 The Loaded Baked Potato was piled high and stuffed with brisket, sausage, butter, cheddar cheese, sour cream and chives. 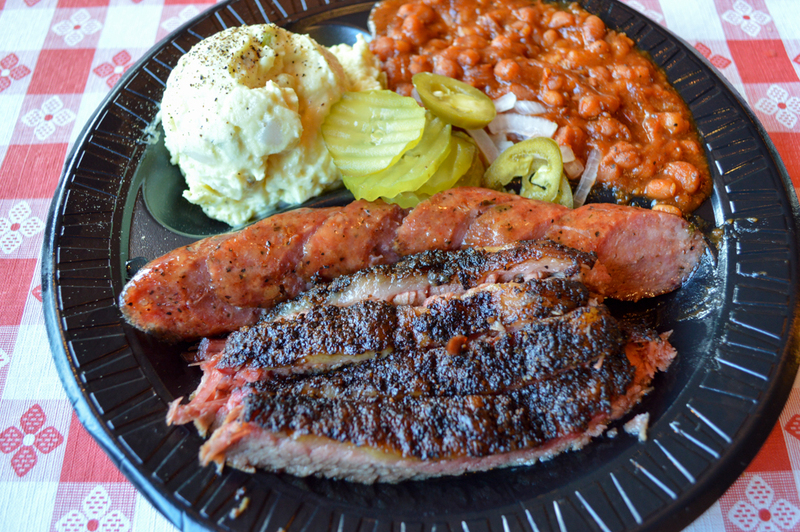 I can’t get enough of this brisket, and the sausage gave me a nice little option. So, I went back and forth until I almost ate the whole thing. When eating BBQ, I think it is wise to taste everything. How else will you know what to order next time, right? And that is exactly what we did. 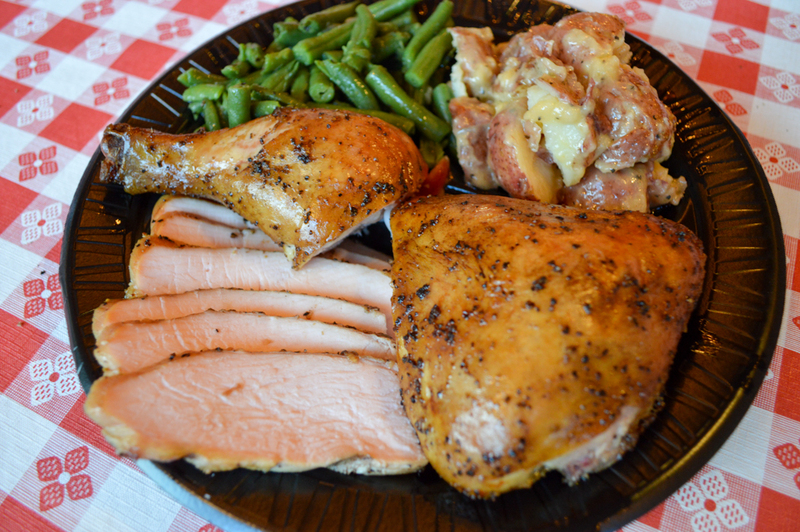 We ordered the Smoked Pork Spare Ribs, Smoked Brisket, Sausage, Smoked Turkey Breast and Chicken. We got a couple of more craft beers and jumped in head first! 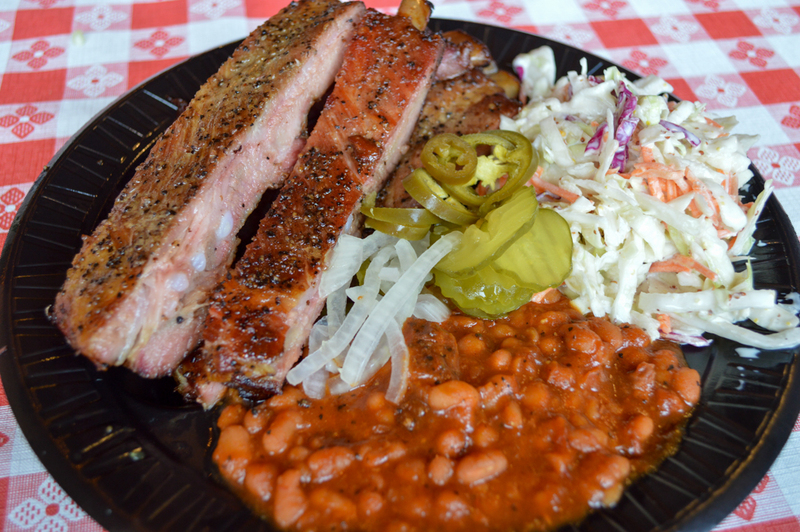 The Smoked Pork Spare Ribs were up first and paired with Cole Slaw and Baked Beans. 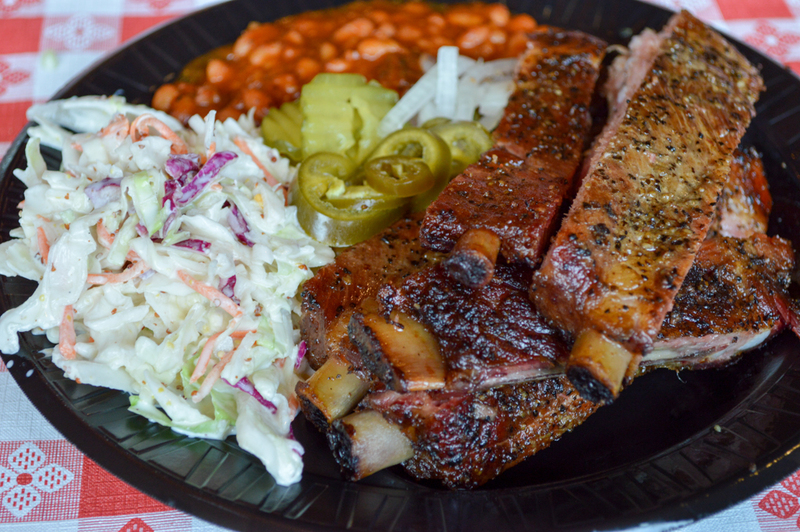 These juicy ribs were so good – moist and smoky sweet! 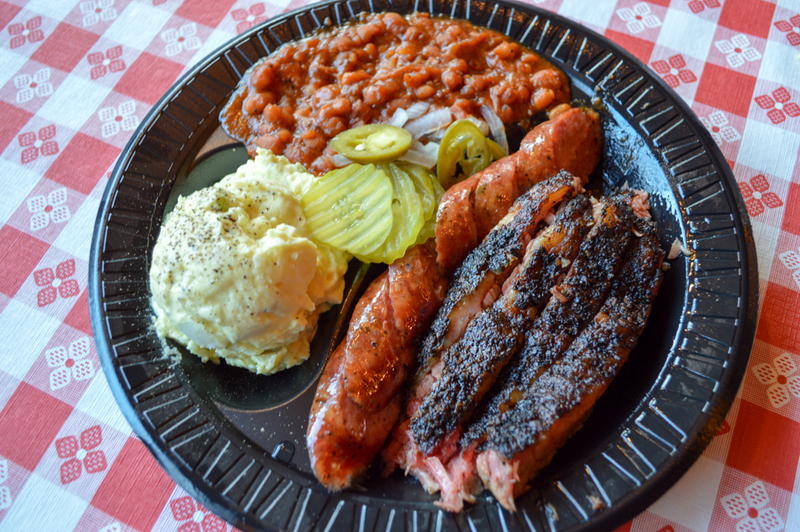 The Cole Slaw and Baked Beans were great, but I couldn’t get my mind off all the smoky meat I had in front of me. Next up was my favorite of the afternoon. 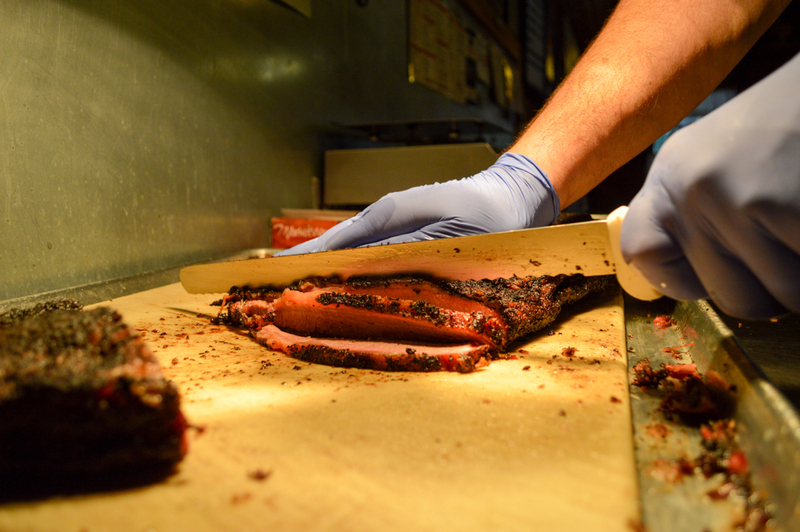 The Smoked Brisket is the headliner in this band. I must admit I am a brisket guy, but good is good and this brisket here at Witt Pit BBQ is great! I highly recommend you get a 3-meat plate and try some of the other meats you enjoy, but don’t leave the building without trying this Brisket. Just let them know if you want it fatty or not. Or try both! 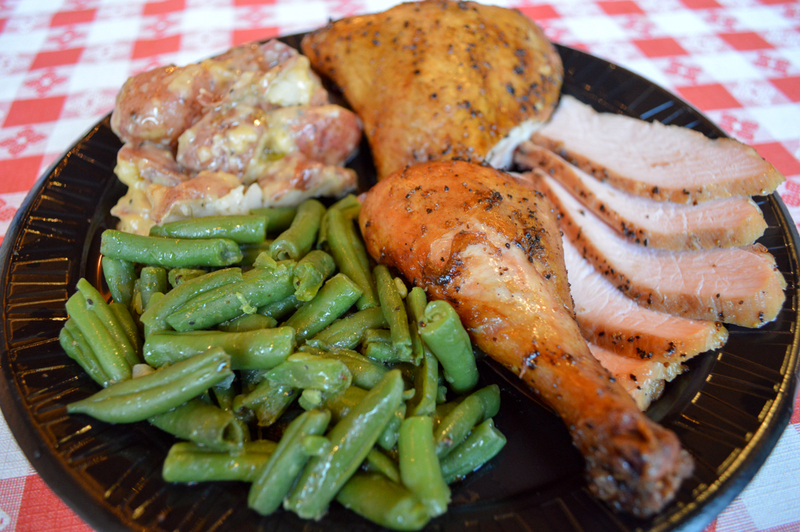 The Smoked Turkey Breast and Chicken plate we ordered was served with red potatoes and green beans. 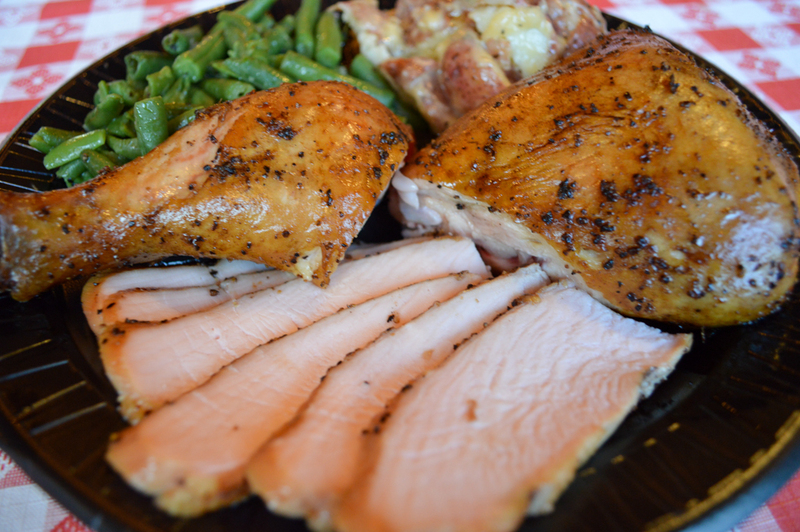 Both the chicken and turkey were full of that delicious smoky flavor which you can only get from smoking it in a 30-year-old steel offset, reverse-flow pit. You bet! The Buttered Red Potatoes were exceptional. 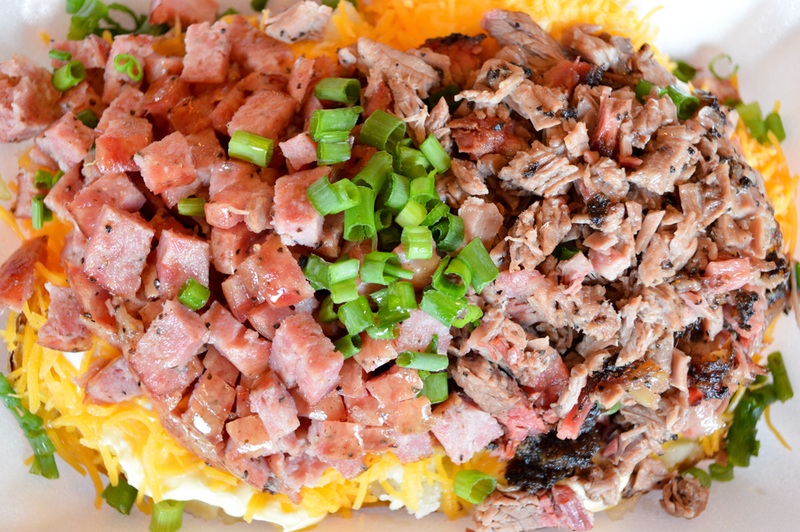 If you’re looking for something a little different as a side, then try these potatoes. The buttery goodness is SOMETHING SPECIAL! If you haven’t already noticed, my favorite dish of the night was the Smoked Brisket. 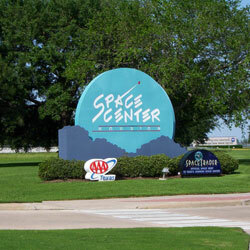 However, there was nothing left when we left, so that should tell you exactly how I felt about the rest. Ha! 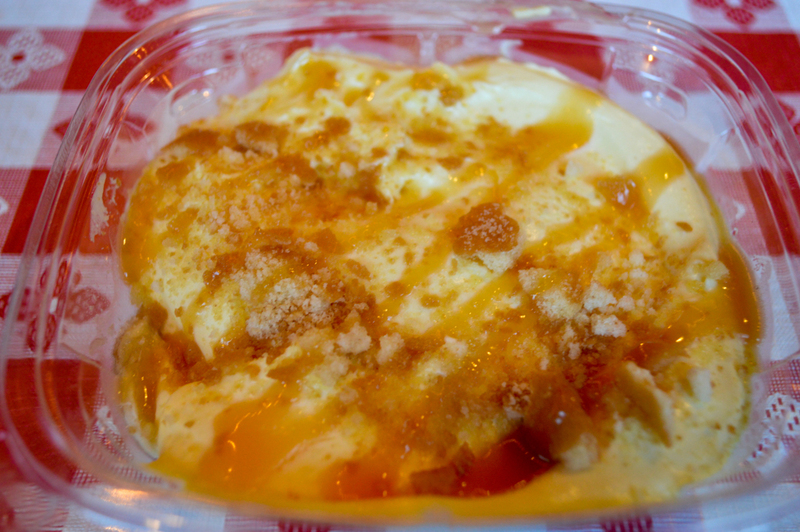 To top it all off, Home-Made Peach Cobbler and Banana Pudding were served up with Vanilla Ice Cream. 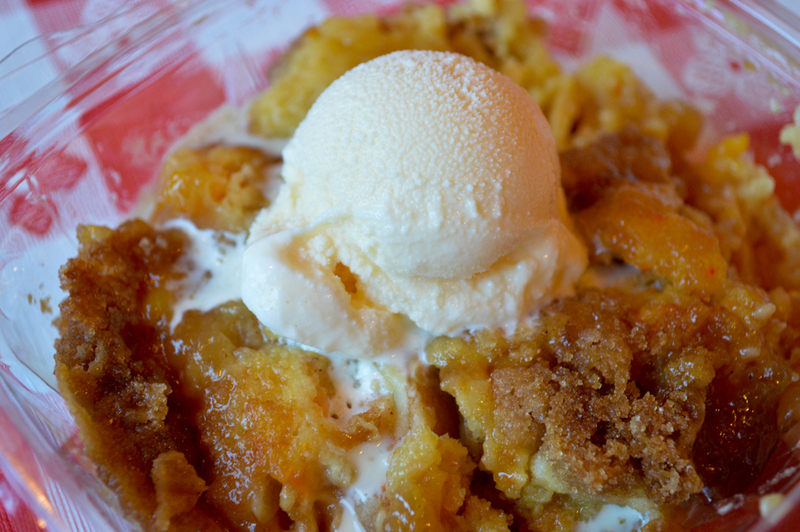 These sweet, sweet desserts were made with Witt Family Love… I could taste it in every bite. 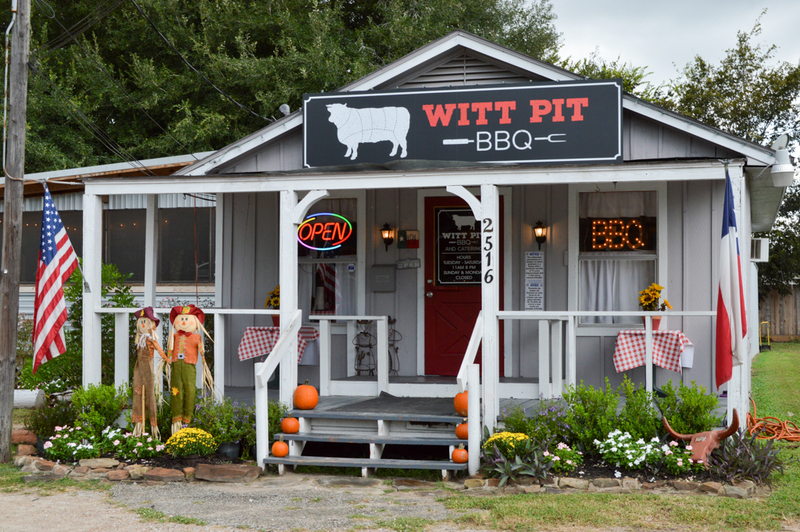 Witt Pit BBQ is Texas-style real pit BBQ! 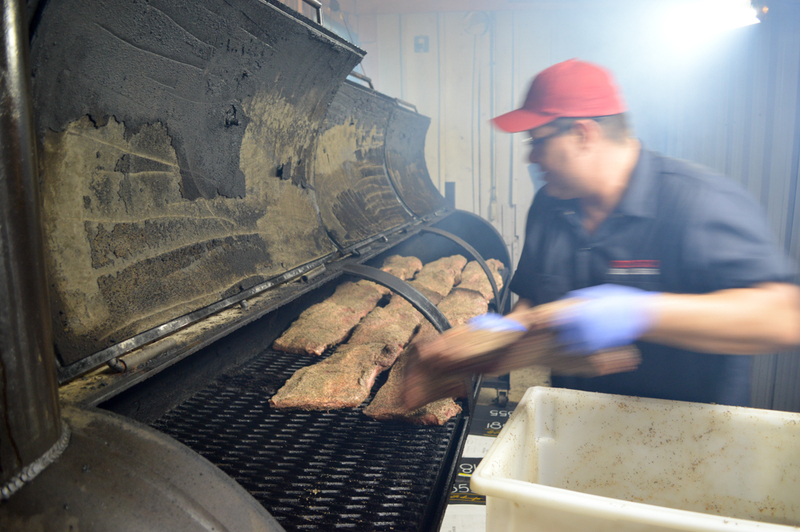 From the minute you drive up, you are fully emerged in the Texas BBQ experience – from the Texas décor to the fine, smoky aroma that fills the air. Witt Pit BBQ has me hooked. 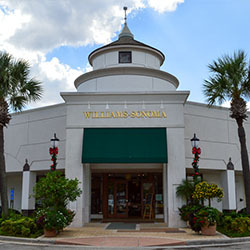 Believe me, it’s worth the drive!